Okumura Roshi represents one of a few Japanese Zen masters who traveled overseas to teach Western audiences about Buddhism. He brings with him the truly unique perspective of the practitioner-scholar. Okumura is one of those few people alive today able to convey the essentials of the vast, mostly untranslated (and therefore inaccessible) Japanese Zen canon to Western audiences. Uniquely, he combines this knowledge with the experience of a lifetime practicing zazen. In his writings and lectures, he illuminates Dōgen’s texts from both perspectives. Shohaku Okumura was born in Osaka, Japan in 1948. He studied Zen Buddhism at Komazawa University in Tokyo and was ordained by Kosho Uchiyama-roshi in 1970. They practiced together until 1975, when Okumura-roshi came to the United States. After practicing at the Pioneer Valley Zendo in Massachusetts until 1981, he returned to Japan, where he began translating Dogen Zenji’s and Uchiyama-roshi’s writings into English. Okumura-roshi was a teacher at the Kyoto Soto Zen Center and later at the Minnesota Zen Meditation Center in Minneapolis, Minnesota. For more than 30 years, he has led sesshins and Dharma study groups in the United States, Japan, Europe and Latin America. 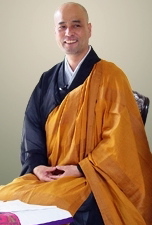 Shohaku Okumura is currently the Abbot of Sanshinji (“Three Minds Temple”) located in Bloomington, Indiana. He is the founder and guiding teacher of Sanshin Zen Community, an international Buddhist sangha founded in 1996. Except where otherwise indicated, the following publications are available on the Purchase page. Living by Vow: A Practical Introduction to Eight Essential Zen Chants and Texts, by Shohaku Okumura, Wisdom Publications, 2012. Dogen’s Genjo Koan: Three Commentaries, by Eihei Dogen, Nishiari Bokusan, Shohaku Okamura and Shunryu Suzuki, Counterpoint, 2012. The Wholehearted Way, by Eihei Dogen, Kosho Uchiyama Roshi, Shohaku Okumura and Taigen Daniel Leighton, Tuttle Publishing, 2011. Nothing Is Hidden : Essays on Zen Master Dogen’s Instructions for the Cook, by Eihei Dogen, Translated by Shohaku Okumura and Jisho Warner, Weatherhill, 2011. Realizing Genjokoan, by Shohaku Okumura and Philip Shoryu Bradley, Wisdom Publications, 2010. Soto Zen: An Introduction to Zazen, by Shohaku Okumura, Sotoshu Shumucho, 2006. Opening the Hand of Thought: Foundations of Zen Buddhist Practice, by Kosho Uchiyama, Translated by Shohaku Okumura and Tom Wright, Wisdom Publications, 2004. Dogen’s Extensive Record: A Translation of the Eihei Koroku, by Eihei Dogen, Translated Shohaku Okumura and Taigen Dan Leighton, Wisdom Publications, 2010. Dogen’s Pure Standards for the Zen Community: A Translation of the Eihei Shingi, by Eihei Dogen, Translated by Shohaku Okumura, Ikko Narasaki Roshi and Jusan Kainei Edward Brown, SUNY NY Press, 1996.